The past couple of days have been “off the charts” for me. God has encouraged and blessed in so many ways. I learned some key leadership skills at the 95Network One Day Conference yesterday and learned even more today about improving my own leadership with Terry Thompson as we worked through the Flippen Profile (an amazing leadership tool). As I shared earlier, the icing on the cake last night was getting to take our 95Network Board to Sweetie Pies where we met Jennifer and heard her amazing story of God’s grace (see earlier post on 2nd Best Server in Wise County). In addition to all this, I just met with Sage Huggins, a young lady who pretty much grew up in Grace and who’s about to graduate from TCU. I was doubly blessed to hear how God has been working in her life at TCU and of her plans to serve Him in missions after graduation. It’s crazy cool to see and hear the commitment and passion of these young adults for Christ! Thank you Lord for this amazing blessing. 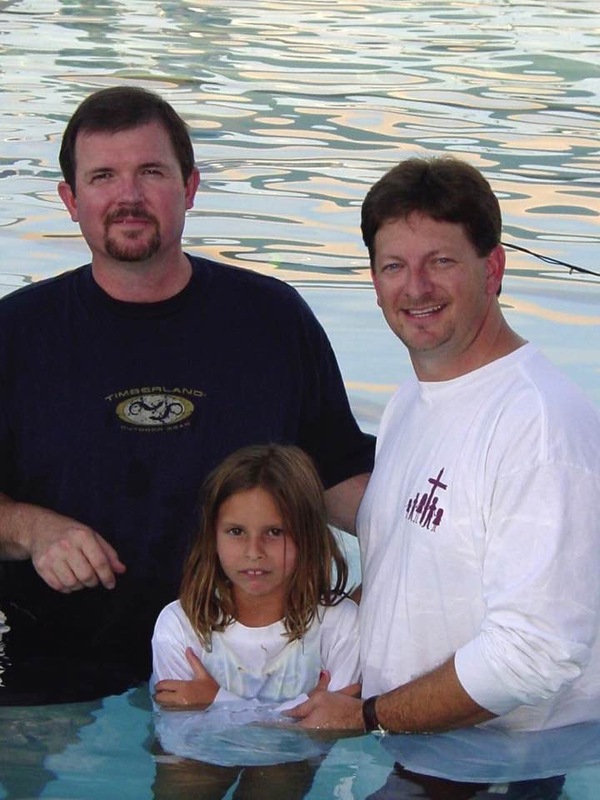 The photo above was probably taken around 14 years ago; it’s me, Sage Huggins and her dad Scott Huggins. This entry was posted in Uncategorized and tagged baptism, blessed, commitment, crazy, Jesus, missions, passion. Bookmark the permalink.